Mandibeads: Thanks for my logo, Pam! I think I'm finally finished tweaking my blog for awhile. I changed the colors and background to match my new logo designed by the fabulous Pamela Michelle! 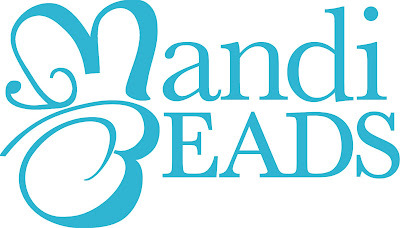 I wanted a butterfly over the i of MandiBeads, but she took it a little further and made the M and B into a butterfly. I just love it!